In addition to all the types of phyllo and the puff pastry, another favorite pie dough is the kourou dough. The recipes available are many and usually contain yogurt, egg and a leavening agent such as baking powder or baking soda, so that the dough can be properly baked. This recipe does not contain yogurt and egg and the dough is unleavened. Its ingredients are simple, it is fasting, delicious and keeps its crispy and flaky texture for several days. It’s made in three stages just because the dough contains no leavens, in order to enclose the air needed between layers and be baked properly. The technique is similar to puff pastry preparation but much easier and much quicker. The recipe produces approximately 1000gr of pie dough and it can be used for any savoury creation. Really worth trying it! 150 g hard margarine, room temp. In the bowl of your mixer sift flour, salt and sugar. Add the room temp. margarine. Mix on low speed using the paddle attachment until you have a fine sand-like mixture. Add the vinegar and the water and keep mixing until the sides of your bowl are clean. Then switch to the hook attachment and knead on medium speed for 5 minutes. Add the cold margarine cubes and mix on low speed just until they’re evenly distributed. Take the dough out onto a well floured surface. 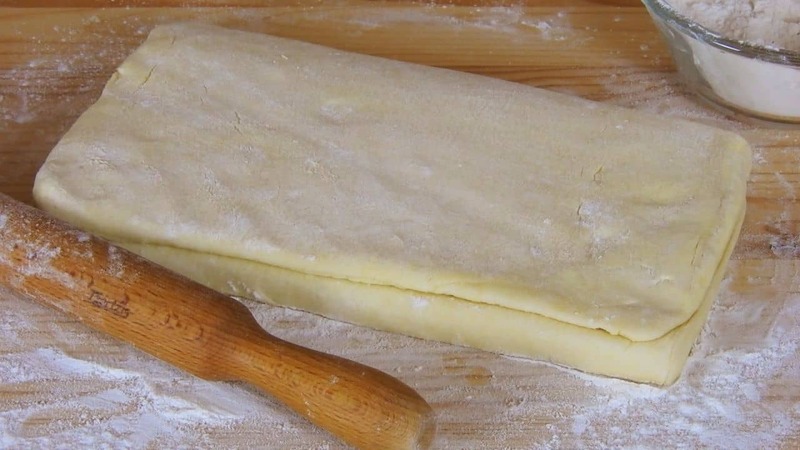 Coat the dough with flour and roll it out into a thick rectangle. Fold both ends until they meet in the center. Fold the dough in half again to complete the first round. Sprinkle with flour, cover with plastic wrap and put in the fridge for 15 min to firm up. Turn the dough through 90 degrees and repeat the process once more. Chill for another 15 minutes. Turn the dough through 90 degrees and roll it into a rectangle. Fold into three. Τurn and roll it out again, fold into three and cover. Allow it to rest for 1 hr in the fridge before using. It keeps well in the fridge for up to 3 days or in the freezer for up to 1 month.